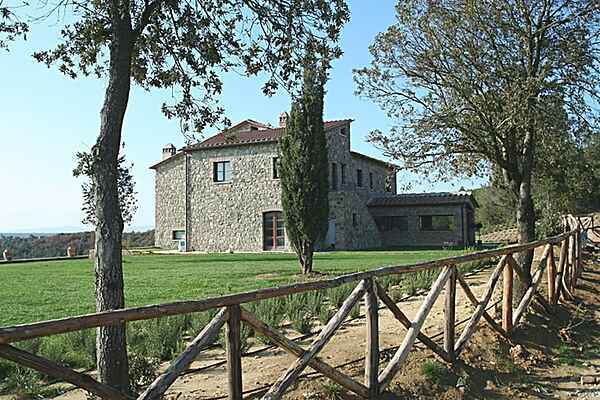 Apartment Mandolino is part of old Villa Poggio alle Monache, typical farmhouse. It is located in tuscan countryside near Siena. it is on 2 floors for about 110 sqm. All modern comforts but ancient character. front entrance from the private garden. Kitchen full equipped (micro,oven,dishwasher,freezer). Nice dining-living room with fireplace, divanetto, Sat Tv. Small bathroom. with pretty balcony, for al fresco relaxing. Double bedroom with ensuite bathroom. All bedrooms have shower stalled. Air conditioning in all rooms.